The Rebel Sweetheart. : The Mauler Takes Over | Alexander Gustafsson in Manila! The Mauler Takes Over | Alexander Gustafsson in Manila! The Philippines has had its fair share of visits from UFC (Ultimate Fighting Championship) stars. Hall of Famer Chuck Liddell has been here, current (and still, even after UFC 167, hehe) Welterweight Champion Georges St-Pierre has been here, BJ Penn has also paid a visit, and of course our very own Filipino Wrecking Machine Mark Munoz has been here, too. This time around, Alexander 'The Mauler' Gustafsson, the man who gave Jon Jones the fight of his life, will be coming to Manila for a Public Open Training. 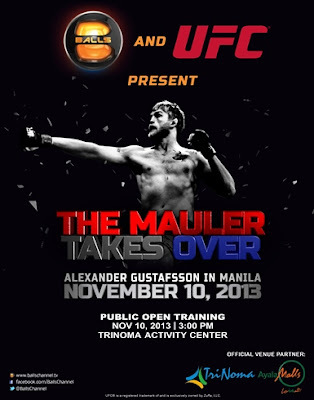 The event, dubbed as 'The Mauler Takes Over' will take place at the Trinoma Activity Center on November 10, 2013. One hundred (100) lucky fans will be given the chance to meet and greet the Swedish mixed martial artist on the said day, and they will also be given the opportunity to take photos with 'The Mauler'. Promo details and mechanics can be found on the Balls Channel official website. Sorry to hear that you'll miss this event, especially because you want to see it so badly. Wishing you a safe trip. Aww, sorry you're gonna miss it. On the bright side, at least you're going to be out of the country. I guess, lol. Not exactly my cup of tea, but since you enjoy this I will keep my fingers and toes crossed that they do schedule there and that you ultimately get to go. I have watched a little UFC here and there, only because my fiance got really into it after seeing it by chance while flipping through the channels. Not bad, but not my thing. Sorry to hear you'll miss the event! I think it's awesome that UFC fighters travel to the Philippines. My husband and son are big fans and we watch the fights on TV all the time. I suspect it is an even greater experience in person but we haven't been to any live fights yet. I hope you get to go to one in Manila someday!